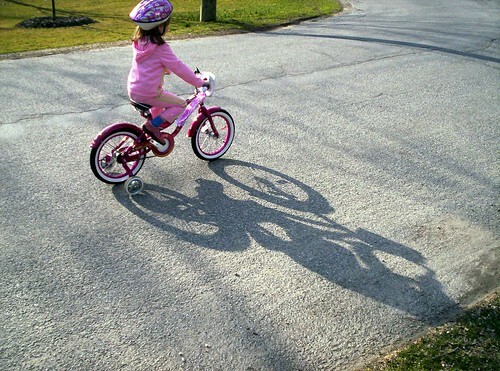 Long bike shadow, originally uploaded by jahansell. My daughter got a new bike today - in fact both of them did, but only my younger daughter wanted to give hers a try, late this afternoon. She's on a pink kick lately - can you tell? Took her a few minutes to get the hang of the bike - it's quite a big bigger than the toddler model she'd been sporting. But it really goes! Over the summer we'll take the training wheels off. I think all girls go through the pink stage...Lynn is 37 and just starting hers again! Everything has to be pink...even her luggage labels.